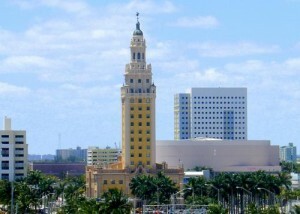 The Freedom Tower is a historic 1925 landmark building in Miami, Florida, that serves as a memorial to Cuban immigration to the United States. It is located at 600 Biscayne Boulevard on the Wolfson Campus of Miami Dade College. On September 10, 1979, it was added to the U.S. National Register of Historic Places. It was designated a U.S. National Historic Landmark on October 6, 2008. Originally completed in 1925 as the headquarters and printing facility of The Miami News newspaper, it is an example of Mediterranean Revival style with design elements borrowed from the Giralda Tower in Seville, Spain. Its cupola on a 255 foot (78 m) tower contained a decorative beacon. The Miami News vacated the building in 1957 to move to a new state-of-the-art facility on the Miami River. As refugees from Cuba fleeing the Castro communist regime arrived in Miami in the 1960s, the federal government used the facility to process, document and provide medical and dental services for the newcomers. After the major wave of refugees ended in 1972, the government sold the building in 1974.